A short quick post, because you could still go to my recommended “rock show” tomorrow, and if not tomorrow, put it on your “must do list” for next year. I still owe you my North Conway, and Red Lion Inn overnights, but quickly here are some adventures. On Friday the 22nd I delivered a grant request to Concord. Some of you may be aware of my involvement in stopping the building of a gas station in Town, and the subsequent work to get the Connecticut River frontage property in total conservation in perpetuity. A round trip to Concord to delivery paperwork? No way – always other things to do. 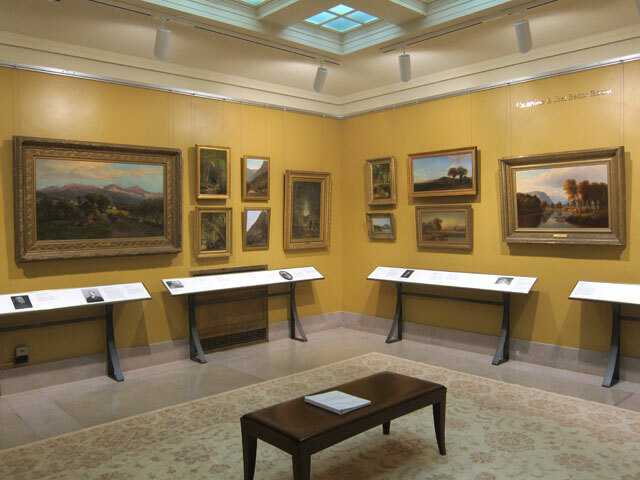 I needed to get to the New Hampshire Historical Society in its main building. No parking available on other tries. For years the historical society had a second exhibit location and gift shop off Main Street. It was great, in fact, Cathy and I traveled from Connecticut in 1999 to see an exhibit on the White Mountains. Other trips to that satellite location for exhibits where wonderful. But, now with consolidation in the original society’s building with limited exhibit space, I was disappointed. No need for you to visit. 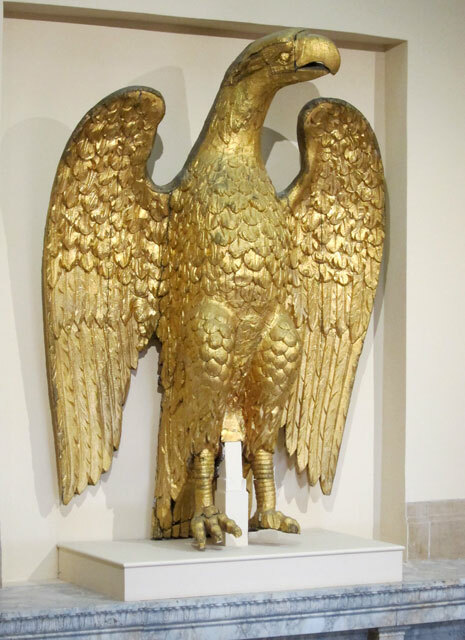 Heading up the stairs is the New Hampshire State House Eagle carved in 1818, and 6 1/2 feet tall. It adorned the top of the NH State House – the oldest in the nation – until replaced in 1957 with a gilded copper version. 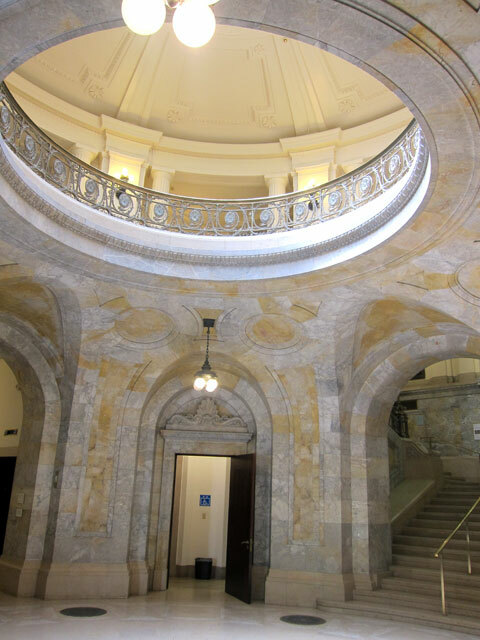 On the second floor there were two small exhibition spaces. 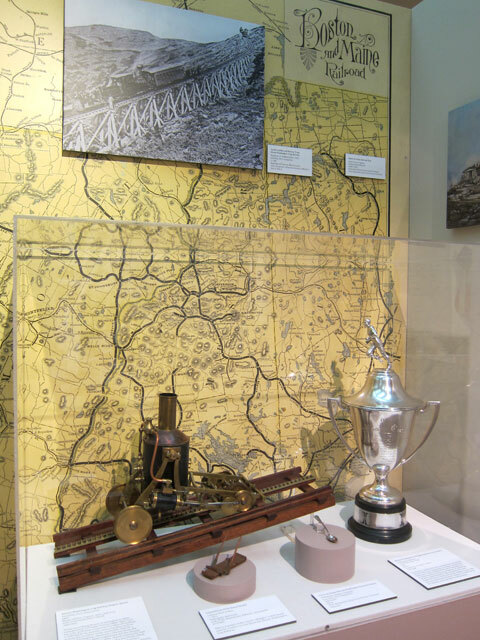 One hall’s exhibit was “Discover New Hampshire” with various historical artifacts nicely displayed such as this Mount Washington exhibit. FAST FACT from the display of the Ballot Box used in Hart’s Location from the 1850s to about 1980. Did you know why this town of about 37 residents along Dixville Notch were the first to vote in the nation’s first primary? Well, most residents worked for the railroad and had to be at work before the polls would normally open. Only in our wonderful State. 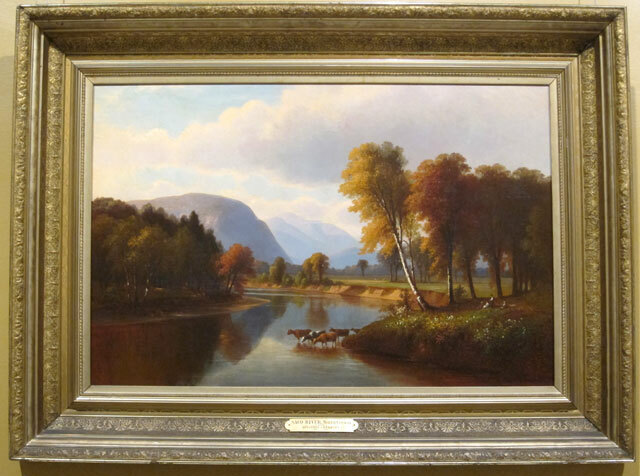 The other gallery had art of the White Mountains. Two paintings really caught my eye. 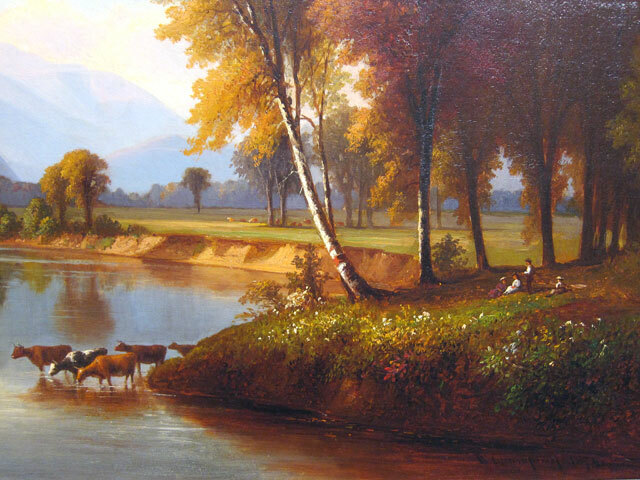 This first is “A View on the Saco” by Godfrey N. Frankenstein done in 1847. Similar to some scenes I will eventually show you of my train ride up the Saco. The railroad’s trestle I crossed is named for Frankenstein. Benjamin Champney (1817-1907) had his home and studio in North Conway near popular tourist lodgings. 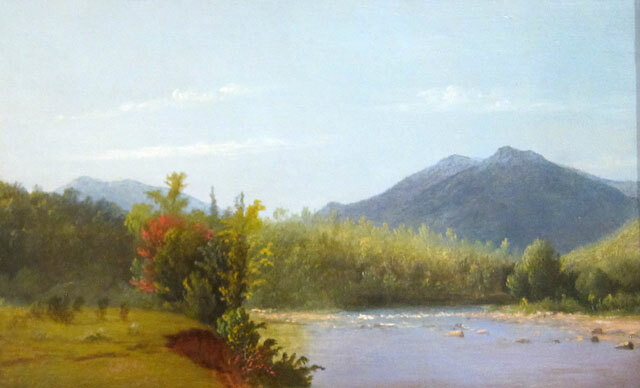 Welcoming tourists to his studio, many bought his paintings as “exquisite souvenirs of a Conway summer.” His 1874 oil on canvas of “Saco River, North Conway,” is considered a masterpiece with its pastoral foreground, winding river, and distant cloud-covered mountains. 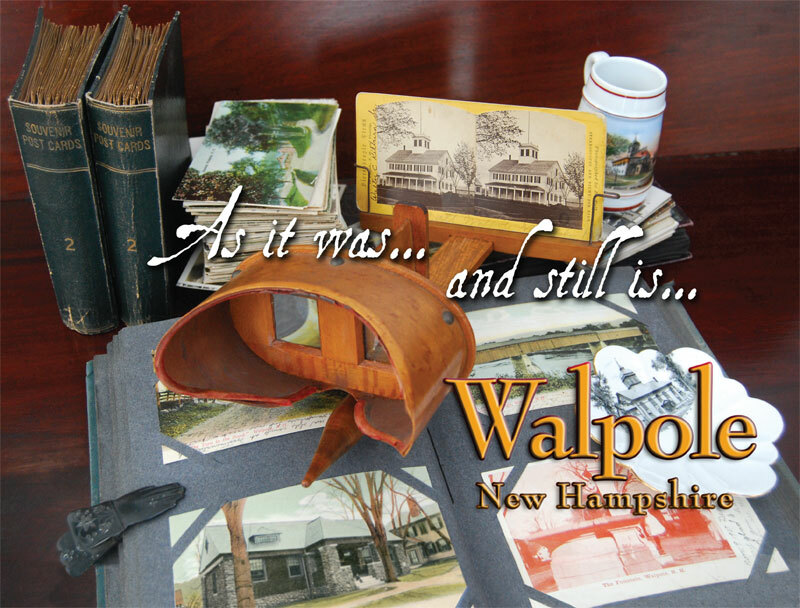 I have wanted to gift a copy of my Walpole book to the historical society library for its New Hampshire collection, and was able to do so. Library director, Sarah E. Galligan, graciously accepted my gift. Never having explored north of the State House before, I drove through an architecturally interesting area. Wandering up and down hill, I picked up Route 3 and continued north for awhile past the State Prison. Turning around I stopped at the New Hampshire Department of Corrections Retail Showroom. Chatting with the attendant, I learned of the various programs for inmates to be employed making furniture, or to learn or pursue their crafts. An upholstery service is provided for those wishing to have furniture restored and recovered. You know this “hopeless romantic” has several passions, and I could not resist this purchase for all of $8. My dear late-bride loved rocks and minerals. 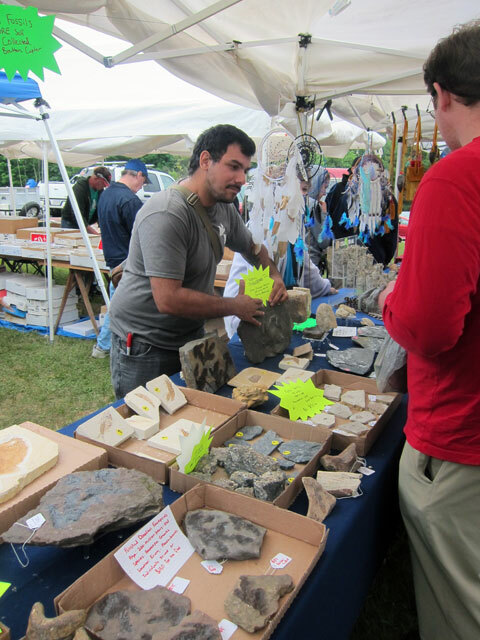 Would you believe we never attended the Rock Swap and Mineral Show in neighboring Gilsum? 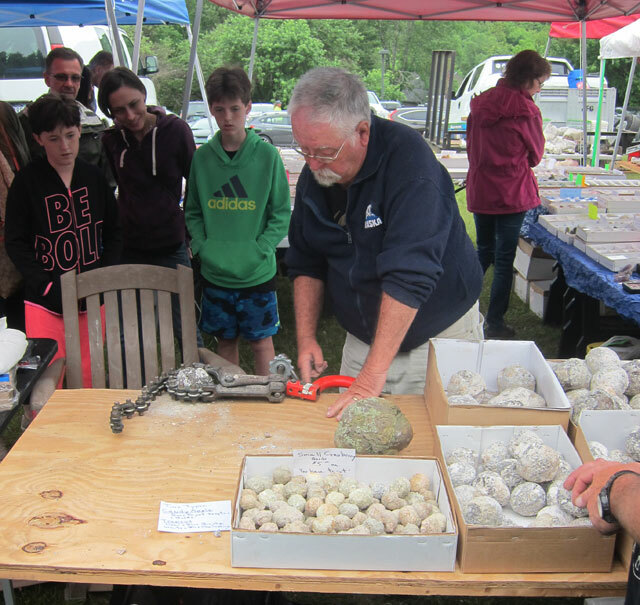 This weekend is the 54th Annual Rock Swap, and it has been “on my list” for weeks to attend. In spite of impending rain, I departed about 10 AM, arriving shortly later. 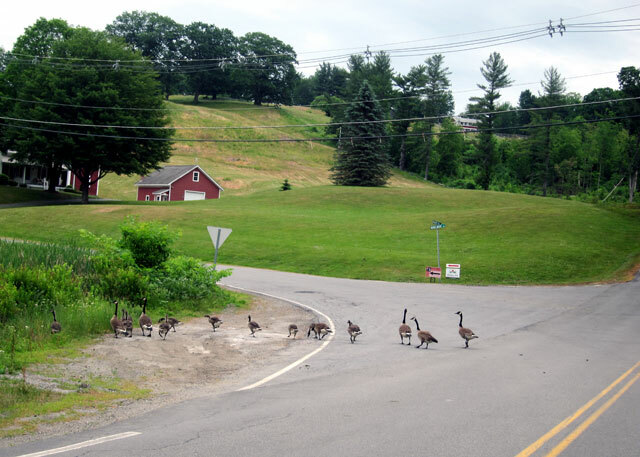 But, a slight traffic delay on the way at the intersection of Prospect Hill Road and Maple Grove Road. BLACK BEAUTY was able to tuck into a small spot in the packed fields. 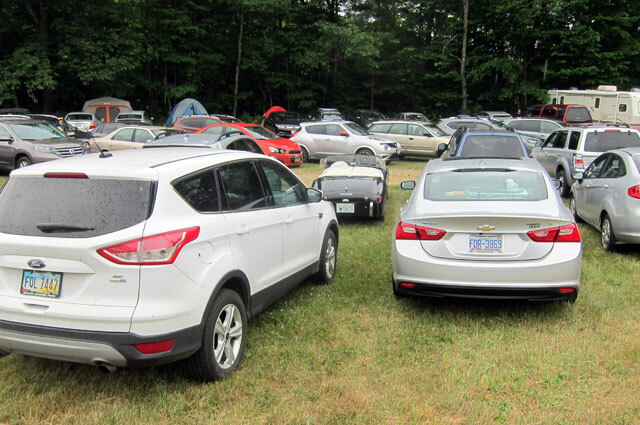 Around her were cars with license plates from North Carolina, Ohio, Massachusetts, Maine, Vermont, and more. This event is a big deal. There was eye candy (or “rock candy”) everywhere. I have so much I want to learn. Ironically, I had previously scheduled a week long seminar in July on the geological development of the Connecticut River Valley, and have been learning about Lake Hitchcock and the aquifers in our area. A study of rocks and fossils at the show was a natural thing for me to finally do. Below a fellow was selling geods. You could make a selection, and then he would open the stone. 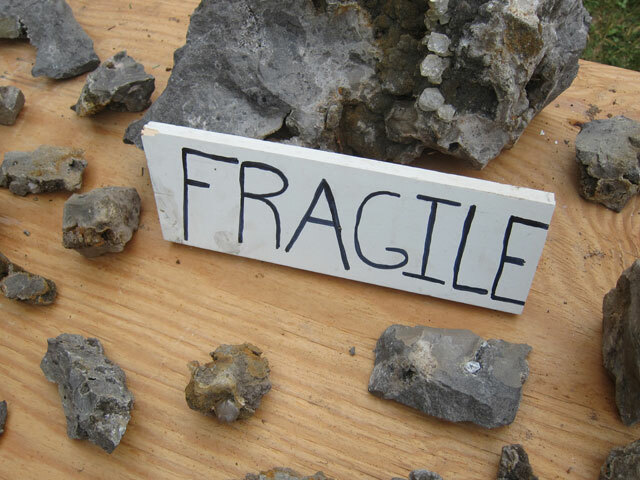 Rocks – Fragile? An oxymoron at best. But the fragile part are the embedded Herkimer Diamond from New York State – have to learn about them. I found Brett one of the most fascinating individuals there. A Native American in his 30s, he has been working with rocks, fossils and the like his entire life. Living in Scotland for 10 years he even found a partial dinosaur which he sold to a California museum. 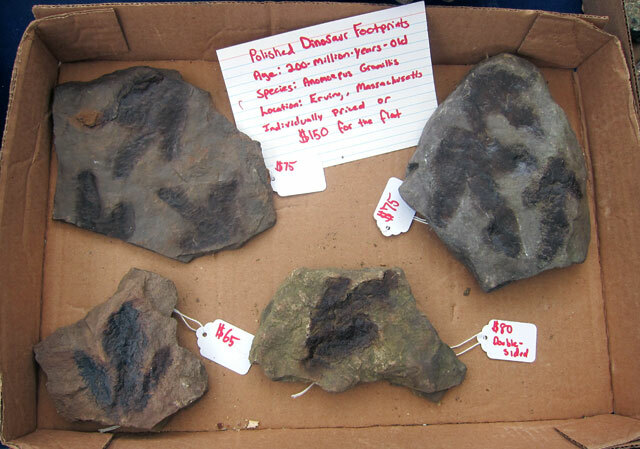 He had on display dinosaur footsteps he has found in Erving, Massachusetts and other related fossils. 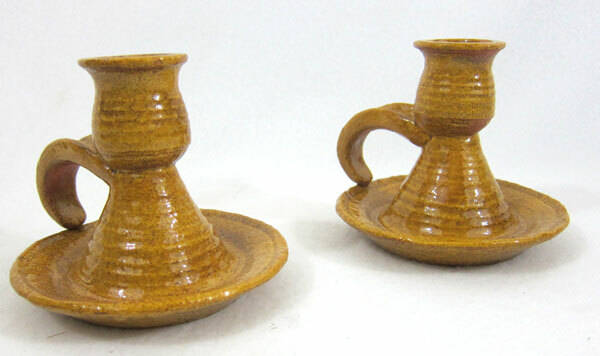 A great website – Bretton Carter should be your “go to source” for the “real deal” in authentic items. These are dinosaur footprints he found in an area near where Edward Hitchcock found the first such prints in the Connecticut River Valley. From 1 PM to almost 2:30 I attended the Nancy Swing’s lecture “Rock-Hounding in New England.” Interesting history, fascinating anecdotes, and more things prompting my need and desire to learn more. 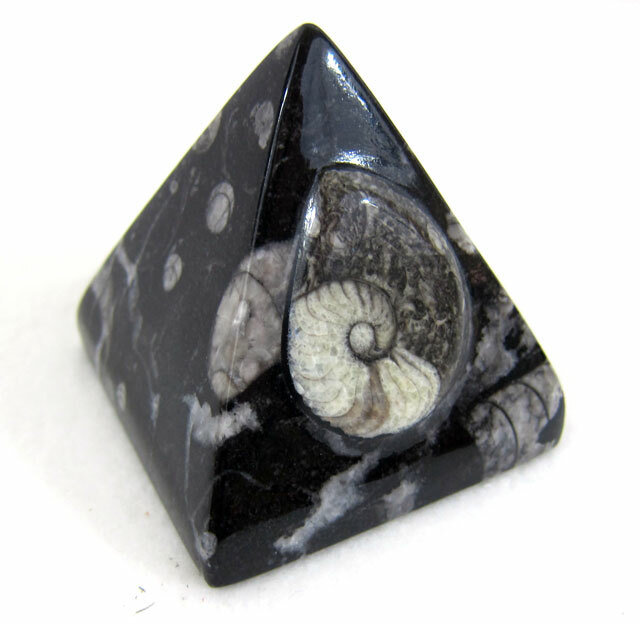 I had to buy something, and this 2 1/4 inch square (at the base) pyramid is from Morocco. A good number of the fossils of primitive cephalopods were exhibited. I now have a unique paperweight. 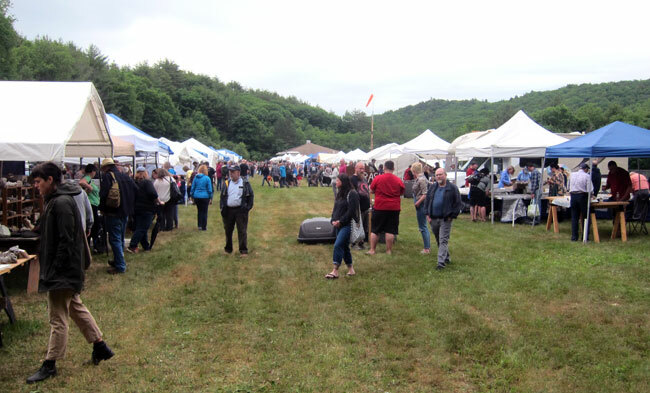 A great day out, and if you cannot make it to the 54th Annual Gilsum Rock Swap & Mineral Show tomorrow, June 24, please plan to go next year for the 55th – you will not be disappointed. This entry was posted in Day (or maybe two) Trips and tagged Gilsum NH, Gilsum Rock Swap. Bookmark the permalink. Very interesting, Ray. I’ve always wanted to go to the rock swap someday, too. Peter and I found lots of shell fossils on the Jurassic Coast of western England. We were staying in Lyme Regis. Hope to go back someday!